Docked in the shadow of the casinos in the Marina section, Atlantic City's commercial fishing fleet focuses almost exclusively on surf clams and ocean quohogs. This specialized fishery, accomplished primarily by larger (70 to 150 feet in total length) vessels equipped with hydraulic dredges, provides much of the world's supply of minced clams and clam strips. 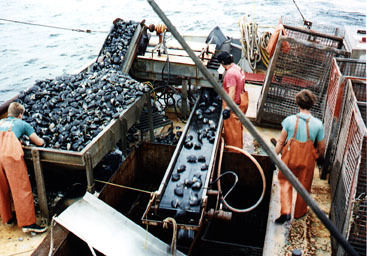 With no clam processing facilities in Atlantic City, the clams landed there are trucked to plants in Southern New Jersey or on the Delmarva peninsula.